This May I was fortunate enough to travel to Europe and spend the entire month touring various countries, including Austria, Germany and Italy. As an Art History/Classics major, the focus of my travels were mainly museums, galleries and archaeological sites that I had previously studied at McMaster and now had the chance to experience in person. While every sight I visited was exciting in its own way, there were couple of highlights that made my trip really memorable. 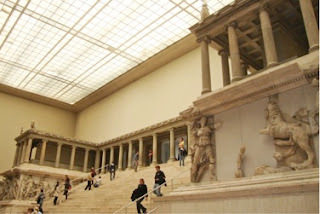 The first one was the Pergamon Museum, one of five large scale museums on the so called “museum island” in Berlin. The museum takes its name from the Pergamon Temple of Zeus , which is displayed inside along with the Ishtar Gate of Babylon, Miletus market gate and other architectural wonders, all moved here brick by brick from their original settings . My trip to Vienna involved a visit to another vast museum of art, the Kunsthistorisches Museum, which, among others, has an extensive collection of Roman antiquities – my favourite being the sardonyx cameos such as the Gemma Augustae. 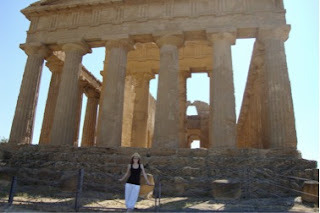 Last but not least was my trip to Sicily where I was particularly interested in visiting the Valley of Temples in Agrigento. Since I’ve not yet been to Greece, this was my first encounter with ancient Greek temples in situ. It was an amazing experience which inspired me to further research this ancient site, in particular the Olympieion, for the seminar courses I’ll be taking in the upcoming year at McMaster. Looking back at my trip, despite all the blisters from walking and many hours spent at airport terminals, I am glad that I packed my itinerary with so many destinations and in turn got to see some of world’s greatest works of art. No textbook image can beat the experience of standing before an ancient marble statue admiring its beauty or retracing the sacred route to a temple honoured centuries ago.